Disney Parks have always had massive popular appeal. They draw people from all walks of life, and have amassed something of a cult following (if you ever want to head down the rabbit hole, go to the Disneyland subreddit). With such fantastic production and a seemingly perfect facade, people clamor at the chance to glimpse of the machine behind the magic. This fascination has created an entire subculture of blogs, YouTube deep-dive videos, and tell-all books written to give an insider take. 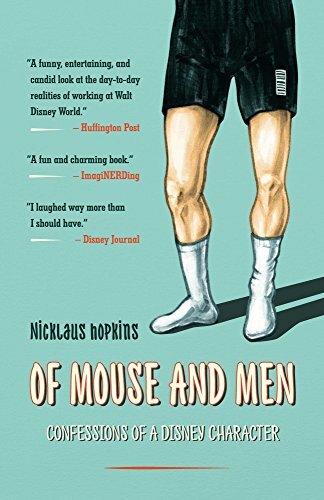 As a Disney fan myself, I was thrilled to be given the opportunity to read this book and to learn a bit more about the daily life of one of the thousands of cast members at Disney World. Of Mouse and Men follows the author as he trains, and subsequently performs, as a masked character in Walt Disney World. His journey begins when he is offered a sweet new gig – character performer in Walt Disney World. It’s any Disney fanatic’s dream job – he gets to be paid to spend time in Disney World as one of his favorite characters. Right off the bat, training is a grueling ordeal – hours in a heavy, cumbersome costume in Florida heat. It’s this part of the book that I found I enjoyed the most. I really enjoyed how honest Nicklaus was about his early missteps. He made mistakes, he learned, grew as a performer, and never seems to lose his optimism and passion for his job. Top Ten Tuesday is a weekly meme by The Artsy Reader. This week’s prompt is Winter 2018 TBR. I’ve been trying to limit my TBR this year – only reading the books I’m really, truly interested reading.